-Knights von Deutschland was founded on June 22nd, 2005 by Hotchi, Hellspaw, and nicnewry, right when paratroopers were introduced into the game. Later came two rats sirbenny and latham. In the past we have had some of the greatest HC officers come though our squad, i.e. Retired OKA Kbees. We have had someone of the greatest game veterans who have helped lead the axis forces to victory. -Your main duty in KVD is to work with other members of the squad to help the Axis GHC defeat the allied mainpower. 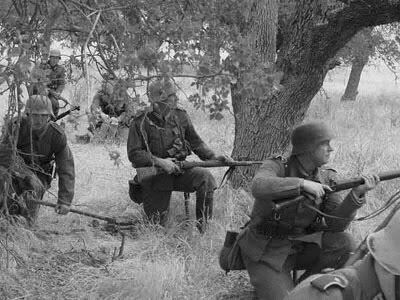 -We are a squad of the 2.Fallschirmjager Division under the 12th Armee, so were are mainly a Fallschirmjager Squad. -As well we do many other areas of work, with the great defender of olavv. We act as a defensive group for the most part, but we do our share of attacks. -Members are only allowed to play allied during training server sessions or intermission. If you are caught playing allied during campaign you will be suspended. -As a member you are required to show some activity on the forums, to gain more knowledge of the squad you are part of. -We require you show every members of KVD with the most respect possible. -All KVD members are asked you put KVD infront of their names unless they are HC officers. -Please go to okw.wwiiol.net to register for the TS server. you must do this to log into the server. If you are in need of help please just ask. KVD's TS channel is all channels below 2.Fallschirmjager, we mostly use 2.1FJ Bravo as our channel. -We ask that you treat this as only a game, it is nothing more. -We focus on Teamwork to acomplish objectives. -All members are required to join. You do not have to post every single day within the forums, but we do expect you to check updated and keep active on the forums. Some members have dedicated their time to advancing these forums. -please use the forums to get to know your fellow squad mates, to train and to learn more about how the game works. The squad is always up and is good to spare some time to use. -We have a new set sytem of how you can be promoted ingame squad ranks. -All recruits recruited are put up to member ingame but are still considered a Junior member for 1-2 weeks. Staff will then put them to status Full member. -To become a squad recruiter you must be in squad for 60 days (returning squad members are a exception tothis rules). Past 60 days, members will be given status Senior member. -To become an XO must be approved by the Squad CO, XO, and XXO. You must be in squad for 6-7 months. Past this time recruiters will be come Senior Recruiters. CO Approval Required!